THE DINDOSHI police registered a case of forgery and cheating against unidentified agents on Saturday after 66 parents approached them with complaints. The parents, who had applied for admission for their children under the Right to Education Act, said the agents had charged them huge amounts in return for bogus income certificates. Gayatri Gupta, a parent from Malad east seeking admission for her son, said she had paid Rs 3,000 to an agent last year after the latter promised the certificate in a couple of days. “He (the agent) said the process of getting an income certificate would take 15-20 days but he could get it done in a couple of days,” she said. She said she had submitted the certificate online during admissions last year but realised that it was fake after the school told her so this April. “I was told by the school management that my son’s admission had been cancelled because the income certificate we had submitted was bogus,” she said. According to the police, the parents were vying for 25 per cent seats reserved for the Economically Weaker Sections under RTE at five ICSE-board schools run by the Goenka Education Trust in Goregaon East. Inspector Ravi Adane said the parents had obtained the income certificates, declaring that they belong to the EWS, through agents and submitted those at the schools while seeking admission. “The schools sent the certificates to the tehsildar office for scrutiny. But the tehsildar said the certificates were bogus,” he said. Rubina Patel, another parent, said she had taken an agent’s help in 2013 after many of her neighbours in the E-ward slums had successfully gained admission for their children through the agent. “The agent had a reputation for getting income certificates in time in the area. I came to know about him through word-of-mouth and later sought his help for my daughter’s admission to nursery in 2013. I only found out that the certificate was fake this year,” said Patel. “The schools are not responsible for the certificates. When we asked the parents, they said they do not know who the agents are,” he said. The police are looking for the agents. Mumbai: The state government has increased the reimbursement given to schoolsfor students admitted under the Right to Education Act 2009 in the 2015-16 academic year. Schools will now receive a maximum of Rs 17,329 per student as fees for the year. This is up from last year’s Rs 13,474. Schools have welcomed the hike, though many of them have not received reimbursement for the past several years. All unaided non-minority schools in the state have to reserve 25% of their entry-level intake capacity for admission to students from economically weaker sections. A recent government resolution , issued by the state school education department, said schools will be given reimbursement of Rs 17,329 or the actual tutition fees, whichever is lower, for RTE admissions. Unaided schools in the city and state have said that they will not be reopening on the scheduled June 15 date as the government has failed to reimburse the fees for the students admitted under 25 per cent reservation quota of the Right to Education (RTE) Act for the past three years. The schools have also said that apart from the reimbursement they also want the amount to be brought at par with what is being paid per student in government run schools. The schools have written to the school education department regarding the same and are awaiting a response from them. Rajendra Singh, president of the Federation of Private Unaided Schools Association of Maharashtra said that in the absence of reimbursements it was becoming extremely difficult for the schools to continue operations. “Numerous unaided schools have refused to accept admissions under the RTE quota for the academic year 2016-17 due to non-payment of arrears. Rather than paying the arrears the state derecognised many of them,” said Mr Singh. He further added, “As the cost of running the school has gone up and the government is not showing any haste in paying the arrears, the private unaided schools across the state are left with no option but to keep the schools shut. We have written to the education department informing them about our decision. If there is still no response, we will be forced to keep the schools shut,” said Mr Singh. While principal secretary of school education Nand Kumar was unreachable for comment, an official said that the reimbursement file of the schools was forwarded to the finance department and their response was awaited. MUMBAI: The state school education department has increased the compensation to schools for admitting students from economically weaker sections to the 25% reserved seats under the Right to Education (RTE) quota. In a notification dated May 30, the state government increased the reimbursement amount to be given to schools by around Rs2,000. Earlier, schools were being paid Rs14, 621 per child during academic year 2013-14 and Rs12,315 per child during academic year 2012-13. The compensation for academic year 2015-16 has been raised to Rs17,321 per child. This proposal has been sent to the Centre for its nod. Schools will be reimbursed this amount or their tuition fees, whichever is less. The amount will keep increasing every year, said officials. Schools, however, have said that the compensation amount is not sufficient and will not cover their expenses. “Besides tuition fees, we also provide several facilities and infrastructure to the students. The amount fixed by the government will barely meet our expenses,” said Amol Dhamdhere, vice-president, Indian Education Society Group of Schools. Some schools are also upset because the notification does not mention any reimbursement for admitting students to the pre-primary section. The Bombay high court had ordered the government to reimburse schools for admitting students to the pre-primary section. KOLHAPUR: The fourth extension to the Right to Education (RTE) 25% admission quota by the district primary education department will come to an end on Monday, May 23 amid poor response. The department earlier had extended the deadline to May 23 from earlier May 16, after receiving the poor response to the admission process. According to the officials the number has not improved much even after the extension. The department was forced to extend the process after it received few registrations; 339 to be specific, for over 3,000 seats in 288 schools. An official from the department said that the admission procedure has been organised through online mode for the very first time, and it is likely that it had an impact on the number of registrations. It has to be noted that last year, with more than 40% RTE seats remaining in vacant position in the district, the admission process had to be extended to the month of September, after the poor response in the district. Under the RTE act, economically and socially disadvantaged children, as well as those with disabilities, can be admitted in Class I or at the pre-primary stage, of private unaided and aided schools. 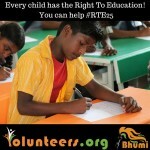 Nagpur: The so-called-efficient free school admissions under the Right To Education (RTE) has proved to be faulty. The very-on-line system has so many lacunae which many unscrupulous parents have used to ensure that their children get admissions. The education department declared the lottery results for free school admissions under the Right To Education (RTE) quota on May 19, 2016 (within 24 hours of holding the draw). However the entire system seems to be faulty alleged many parents. Many parents were disappointed when they realized that their applications have been rejected. Some really very poor people including Cobblers, Bhel Puri Vendors, Vegetable Vendors too wanted their children to study in good schools. Alas, their dreams have been shattered due to the faulty system. How is the system faulty? On a sheer curiosity some of the parents of the children who were rejected admissions under RTE wanted to find out who have got admissions, got a shock of their life when they realized that many parents have bypassed the system and utilized the lacunae in the system and had alleged registered for admissions in as many as 6 schools. Fortunately for these unscrupulous parents, their wards or children have got admissions in 6 schools, while some children have been denied admission even in one school. When Nagpur Today downloaded the list (which runs into 127 pages), it came to fore how many children have been given admissions into two schools, four schools and some children have even been given admissions in 6 schools. Almost all the pages have at least two or three students who have been given admissions in two or more schools. Well one must be wondering how these students got admissions in more than one schools. The unscrupulous parents registered their wards for Admission under RTE using four different mobile numbers (probably belonging to their friends). This way they registered using four different IPs. While speaking to Nagpur Today, the owner of a Net Café owner said that some parents came with three rent-agreements printed on stamp-papers showing different addresses of their friends and then went on to register for the on-line Admissions under RTE. Surprisingly all the four applications got accepted and even more surprising is the fact that the child got admitted in four different schools. Technically, making the system fool-proof was the responsibility of the authorities. The authorities should have made a system which does not accept the same names of students with the same parents’ name and the same address. Any duplication should have automatically disqualified the students. This would have prevented unscrupulous parents from succeeding in getting admissions in many schools when some genuine parents tried only one school being rejected. While speaking to some media personnel, Co-ordinator for Sarva Shiksha Abhiyaan (SSA) Premchand Raut had said that the lottery results have come and parents have been intimated through SMS on their registered mobile numbers. The admission process for selected applicants is slated to start today, i.e. on May 20, 2016. All the admission formalities have to be completed between May 19, 2016 to May 28, 2016. Parents need to ensure that all documents are in order and have to submit them to the school accordingly. He added that parents must carry originals of the documents they had submitted during application process. It is important that both documents must absolutely be the same, otherwise the applications will not be accepted said an official. The official also said that the Schools will verify address proof very carefully as location of school with respect to the applicant’s residence is the most crucial parameter. Rules say applicants must select schools between 1-3km radius from their residence. While applying online, the applicant has to pinpoint his residential address of Google Map after which the software throws up names of eligible schools. Since mapping is done completely based on applicants’ input, it is vital to cross check address proof. Kolhapur: With no takers for the Right to Education (RTE) 25% admission quota, the district primary education department has extended the deadline further to May 23 from the earlier May 16. This is the department’s fourth extension over the past 30 days. The department has seen registration of a meagre 339 applications for over 3,000 seats in 288 schools in the last month. An official from the district primary education department said that schools were asked to fill in all details about their class strength and their entry level point in March. Schools had the power to decide as to whether their entry point would be at the class I or pre-primary level. The next step was applications by the parents, however this was hit hard by technical snags. “The process has witnessed many halts due to technical difficulties over the past two months. Since the admission procedure is online for the very first time, this had quite an impact on the number of registrations,” an official said. The official added that filling the admission form was a requirement to participate in the lottery, which was the next step in the admission process. However, there are hardly any applications opting for the lottery option. Last year, with over 40% RTE seats vacant across the district, the admission process had to be extended to September, after the poor response in the district. The admission process for selected applicants will start on Thursday. Raut said, “Between May 19-28 all admission formalities have to be completed. Parents need to ensure that all documents are in order and have to submit them to the school accordingly.” He added that parents must carry originals of the documents they had submitted during application process. “It is important that both documents must absolutely be the same, otherwise they won’t be accepted,” said Raut. Schools will verify address proof very carefully as location of school with respect to the applicant’s residence is the most crucial parameter. Rules say applicants must select schools between 1-3km radius from their residence. While applying online, the applicant has to pinpoint his residential address of Google Map after which the software throws up names of eligible schools. Since mapping is done completely based on applicants’ input, it is vital to cross check address proof. Sharif felt that this is healthy sign. “People are looking at a variety of factors. The high number of applications for state board schools gives a clear indication on the changing view point of parents,” said Sharif. Nagpur: Within a week, fate of almost 14,000 applicants for free seats in school under Right To Education (RTE) quota will be decided. On Tuesday, the education department completed the first phase of RTE lottery draw by choosing numbers to fill up the “number grid”, which the software uses to compute the lottery results. By next week, the final results will be declared and conveyed to the parents via SMSon their registered mobile numbers. NG Ganar, MLC (teachers constituency), took out the first of the 40 digits needed to fill the grid and said he hoped that the entire process will be satisfactory. “I am extremely happy with the way the entire process has been handled so far. The lottery is done through a software which uses the same logic as the Maharashtra State Lottery. I just wish that right till the end, everything works out smoothly and our children find a place to study,” said Ganar. Nashik: The civic education department has extended the deadline for schools to admit students under the 25% reservation under the Right to Education (RTE) Act, from May 15 to May 20. 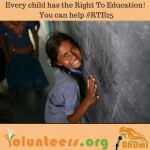 Till now only 660 admissions have been given under RTE under which more than 5,000 seats are available. Out of the 660 admissions, 328 are from the city. The number of seats in the city schools is 2176 but not even 50% of the seats were filled by the schools due to various reasons pertaining to documentation and also preferences of schools by parents. “We extended the deadline for giving admission to the students as the seats are yet to be filled. We want a maximum number of beneficiaries to be admitted under RTE,” said administrative officer of Nashik Municipal Corporation’s education department, Umesh Dongre. He said that schools were giving admissions but some mistakes made by the parents while filling up the forms were causing trouble, and in some cases parents were waiting to get the school of their choice. “Everyone wants the school to be close to their homes. We extended the deadline for ensuring that every child gets admission. After May 20, we will see how many seats remain vacant,” said Dongre. The principal of a reputed school said that they were verifying the documents of that parents had submitted and there were mistakes in many cases. “We have to check everything thoroughly including the address, income and other certificates. We had faced lot of issues with these details last year and if we do not give admission the sympathy goes to the parents automatically. Notices are sent to us and we have to give explanations to the education department,” said the principal.